Media captionWhat did we learn from Elon Musk's big reveal? The tunnel has been built by Mr Musk's Boring Company, which boasts state-of-the-art engineering techniques. Mr Musk, best known as the head of Tesla electric cars and the commercial SpaceX programme, arrived at the launch on Tuesday in a Tesla car modified to work on the "loop" system. The plan envisages modified cars being lowered into the tunnel network by lifts and then slotted into tracks on the "loop". 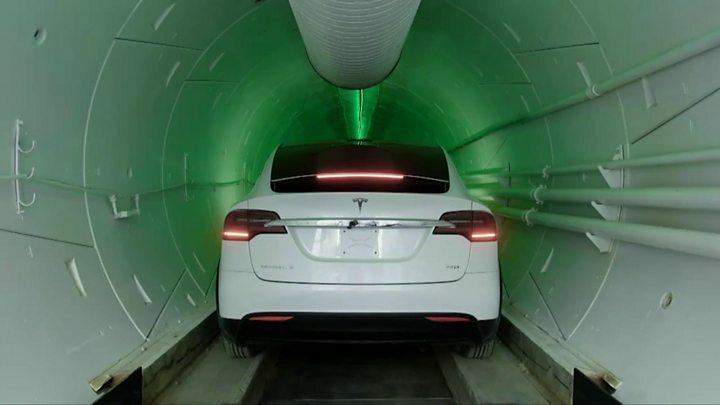 "The profound breakthrough is very simple: it's the ability to turn a normal car into a passively stable vehicle by adding the deployable tracking wheels, stabilising wheels, so that it can travel at high speed through a small tunnel," Mr Musk said. "The way the loop will work is you will have main arteries that are travelling at 150mph and when you want to go to an exit, you will have an off ramp," he added. "So you can travel the vast majority of your journey without stopping at 150mph and only slow down when you get to your exit, and then automatically transfer from one tunnel to another. It's like a 3D highway system underground basically." Elon Musk later explained that the bumpiness was due to problems with a paving machine and that it would be "as smooth as glass" eventually. The vehicle was modified by adding two alignment wheels to keep it stable at high speeds and prevent it from hitting the side of the tunnel. Mr Musk said the $200-$300 attachments could eventually be fixed to any fully autonomous electric vehicle, for use in the tunnel. They would not interfere with the vehicle's normal operation. "We used Tesla vehicles because I run Tesla. What I am going to do? Use someone else's car?" he asked, smiling. "At first he said we're going have these tunnels and transport people in pods, now he's saying we're going to transport them in cars, so I'm not sure even he knows how it works," she said. Mr Musk first unveiled the tunnel plan earlier this year, saying he wanted to alleviate Los Angeles's "soul-destroying" traffic congestion. Virgin's Hyperloop: Future or fantasy?